Celebrities hunt for antiques across the UK. 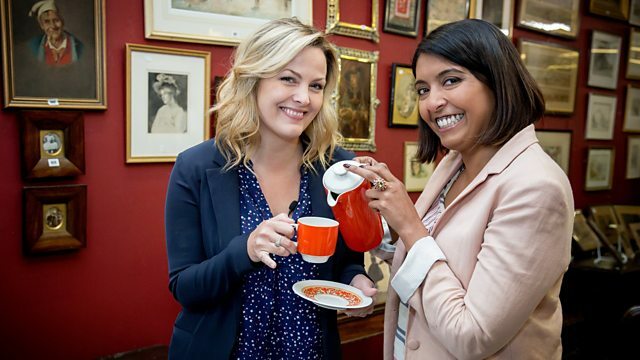 Sunetra Sarker and Jo Joyner go head to head in the search for antique treasure around Somerset and Devon. Browse content similar to Sunetra Sarker and Jo Joyner. Check below for episodes and series from the same categories and more! Sunetra Sarker and Jo Joyner. Hiya! Look at us in a classic car! -All right, Thelma... I feel like Thelma and Louise. -This is the film we always wanted to make, isn't it? I mean, who'd have thought Beth and Anji would ever get behind a car. Let's not drive off a cliff yet. Our glamorous girls will cruise about hill and dale in a lovely 1969 MGB. How would you keep your foot on the brake and the revs at the same time? -Which one do you choose? Sunetra has starred in a number of well-known British dramas. But she's most recognised as consultant Zoe Hanna in Casualty. Hi, Zoe. This is Lea. -Spare pair of hands here? -It's OK, Lenny, I've got this. in 2014's Strictly Come Dancing, which is when I met her. Yes, I've got a little picnic. Always thinking. Always thinking, this girl. Well, they will be by the time we have them, yeah. After appearing in classics like Dr Who, Jo's big break came in 2006. How am I standing here like this? Like an idiot, in this dress, in Christmas! auditioning for British sitcom No Angels. a short skirt, a mini skirt. -That was my Paul's Boutique green army skirt. -You wore an army skirt. -Cos I was going for Beth. Yeah. I think you went against the grain and got it cos of that. -That skirt got you the job. how will these chums deal with the competition? I'm not happy to lose to you at all. I see, our friendship is really in the balance. I'm not about these sports days where everybody gets a medal. They have a rather stately 1969 Jaguar XJ6 to motor about in. Are you a fan of the girls? I did watch Sunitra. In fact, I voted for Sunitra. I thought she was very good. She was really gutsy, you could see. -You mean you didn't vote for Wayne Wonnacott? to have to drive this car at some point. -Yeah, I'm not looking forward to it. Because my legs aren't really long enough. -Seriously, we are both shorties. The fellows are ready and waiting for the girls to arrive. Nice lavender. not the obvious choice for summer. -Well, you know, they are the only trousers I've got. -We can't all be as sartorial as you, James. Ha! -Very good. How are you, my love, all right? Jeepers, that was a close one! I paid her to do that. -Very smoothly driven. Lovely to see you. -I'm going to be your expert. -Very definitely. I voted for this lady. On Strictly Come Dancing. We are taking the smart car. In we hop. -Hang on a second, James. Are you sure? Especially after... Blimey, OK.
in Wiltshire, for the decisive auction. James and Sunetra are first to roll up their sleeves. You know, this is the first time I've ever been in antiques shop. full of lots of delights. This is a real Aladdin's cave, isn't it? Shelley is in charge today. So is this all yours, Shelley? Well, no, it's not ours. It actually belongs to individual traders. There's about 40 traders that rent out spaces from us down here. So there is a real mixture of stock. -All right. See you in a bit. -We'll give you a shout if we need you. but will Sunetra prove a keen pupil? -But we may be lucky. -I'm checking your antique antenna. See now, I like this. I know Jo would love something like this. -Does she love all of her...? She loves trunks and stuff like this. When I looked at it, I thought, "Cor, yeah, that's better." She's getting into the swing of this. Now, what is that you have uncovered? I really like this. I know it's just a tray. Am I just going for Indian things? -It's just that beautiful scrolling flowers, isn't it? I mean, it really is really well decorated. -The Indians like decorations, don't they? So what can you tell about that? Do you know if it's worth anything? so it has the look of being handmade, doesn't it? So they pierce this all out and then it would be plated. How can you tell if that is real silver or not? A man of my, you know... I am using all my senses. -What are you smelling for? -I'm trying to smell silver. Oh, yeah. Oh, I mean... That's guaranteed. I usually look for a hallmark. You won't find one, though, because this tray is silver-plated. -..we'd be on a real bargain. if we found a silver tray that we got for £10. And you know for sure this is not a reproduction? Even if they made it last week, it has weight, it has design. I think I'd like to... Can we make that our first item? -Yeah, come on, let's hang onto it. These two are off to a strong start. -And look, there is a straw hat asking me to try it on. -I don't do hats either. -I wish I could. But I've never done hats before. The winner... The winner gets the hat! Whoever wins gets the hat, that's what I'll say. We'll catch up with Sunetra and James later. raring to get stuck in. So what do you think we should buy, then? Well, basically, I'm just looking for simply the winning thing. Oh, yes, Phil's quite the gent. Will it be all smiles once they get to the hard bit of the shopping? -So what do you like? a pretty china set or something quirky. -Yeah, I know, depending on the budget. This girl's got expensive taste. Right, come on then. Yeah. That could be a problem. -I found this, which I just think is so cute and unusual. So this is a 1950s pair of glasses. -They are Dame Edna, aren't they? so depending on your outfit, you can change them! Look at that. If you are wearing gold, you put the gold on. If you are wearing red, you put the red on. I don't know, will they make us any money? We should be allowed one quirky gift. -We are not paying 58 for them. Spoken like a true pro, Jo. Have you done this before, girl? Ahem, is this a good idea? They're for girls, you know, Phil. -I love them. You look fabulous. -I tell you what, they look better on you than me. Kaye is one of the dealers here, and he's holding the fort today. He is calling the owner of the specs to get the best price. Can you get any closer, you two? Yeah. Have a talk to the lady yourself, though. Hi, Patsy, it's Jo. Were you busy? Were you in the middle of something? She's good, isn't she? I could learn a lot from this. You're probably right. Now, shh. What is your best, best price? 35 would give us a chance. Thank you, we appreciate that. Thanks. Yes. Bye. I think has Jo has better things to do with her time, Phil. The dealer has agreed £35 for the 1950s vintage specs. We will catch up with you two shortly. And what on their rivals? I'd like a stand like this. It is a bit jumbly, isn't it? -Yeah, it is very jumbly. -Half the items don't have price tags on it. Anything catch your eye, Sunetra? James, I really like those. ..who is really, really good at finding antiques. -And she said, "Why don't you look for enamel-plated signs?" so they could be onto a winner here. I like that. What does it say? "White May and Royal Standard BP lamp oils." Yeah, and it says "next to sunshine." -Oh, I didn't notice that. That's good. -There's a little sort of addition. -How much do you think you'd expect to pay for it? It's quite nice. I think it is worth having a look at. Best get it down then. Helpful old chap, this. Now, for a closer look. Thank you. Thank you. Look, as I thought, both sides. -Having it on both sides. -And then feel the weight of it. Never mind the quality, feel the weight. A sign of quality. It is heavy. Is it going to be a problem that it is rusted there? -Some little street urchin has thrown a stone at it. So it would have been on the side of the shop there, so announcing. So people would see, "Lamp oils, we can get our lamp oils." So how far can we date this? I think it is pre-Second World War. I think it is 1920s or '30s. if there's a deal to be done. Shelley is back, Shelley is back. Any news? -I've spoken to the owner and, reluctantly, he said 120. -You were thinking of paying slightly under. Well, I said I wouldn't pay more than 100. If we can get it for 100, we will definitely take it. I am making an executive decision. I think we could squeeze to 100, just on this occasion. -If she can squeeze to 100, we can squeeze to 99. See? Look at her. Well done, you. Well done. A stretching of the arm. Sunetra is blossoming as a star pupil, isn't she? We were going to talk about that tray as well. -Oh, yes, we were. The tray. The original price on the silver-plated tray is £10. -Could you do a deal on it? I probably could do a deal... £5? ..on that one. -Five. We have had a really lovely time here. And I personally am buying the winner's hat. -whoever ends up winning the bargain of the day. Let's concentrate on the money. Great bit of tag-team negotiation there. tray for £5, how's that? Jo and Phil are still shopping on the quay. glasses and jewellery, and now I have found a handbag. -It says "and contents", what is in there? Have you looked? Oh, God, even more intriguing. Open it. Open it. It might be diamonds! -Do you want me to open it? -I want you to. I can do that. Oh, God, I'm going to be so let down if there is nothing in there. Is that a comb? Is it going to be a comb? To do your little kiss curl. I love this. And look, it doesn't stop there. Jo has fallen for it. This chic evening bag was made in Paris around the 1950s. -You love it too now. I have got to stop looking so pleased. -I mean, it's all right. What have we got look for on here, do you think? I don't know. Labels, something decent. Hand stitching. -You're good, you, aren't you? -If we don't know who made it. between priceless and worthless in this business. -I'm just falling in love with it. -but I quite like this handbag. I'm not going to say it suits you either. I'd never say that on telly. -If we can get that for 15, we'd be laughing. Surely you'd get more than ten or 15, wouldn't you? I've never been to an auction, I don't know. -What I'm going to try to do is buy the two 45 quid. -I'm not sure why, Phil. Jo's love of vintage could stand in good stead as it is very popular. Jo has already agreed £35 on the specs with owner Patsy. But is there a deal to be gone on the specs and the little French handbag? She is good, isn't she? She is really good. I have never seen Phil smile so much. We found another little item. another buyer that we need to speak to? -No, I don't do handbags. -Well, not on television, you don't. Kaye is trying to get the owner of the bag. Kaye, are you going to take a risk and be with the winning team? -Two, four, six, there we are. I'm getting a buzz now. This is exciting. Cor, Jo is a feisty negotiator. That is £50 for the 1950s specs and a little bit of vintage. Now, what about James and Sunetra? I think I enjoy being medical. You must be very good at it. Have you ever thought about training to be a medic? -You know, my dad is a doctor. Wait till he sees your shopping. Our route is now heading to Taunton, Somerset. James and Sunetra are taking a break from shopping. followed by one of the most brutal trials in British history. at the Museum of Somerset. -Nice to meet you, James. was the centre of a power struggle to take the throne. Protestant King Charles II ruled at a time of huge religious tension. to take the crown by force. Charles's brother, James, was Catholic. towards the Duke of Monmouth as a potential successor. -So he was a Protestant. -you're unlucky to get at that particular time. With the support of the population, the Duke of Monmouth took action. and he began a march from Lyme Regis via Chard through to Taunton. his sort of band of followers had probably risen to maybe 7,000. -was that he was declared king. So, the only person ever to be declared king in Taunton. still on the throne, the stage was set for a decisive battle. an attack on his uncle's army, stationed nearby. was up the church tower with this spyglass. he saw that they weren't particularly well defended. and to actually leave Bridgwater at the dead of night. -And this was a decision he lived to regret. Probably because they were spotted by one of the Royal scouts. And that was enough to give warning. the Duke's fate was sealed. Was the Duke of Monmouth killed in that moment? No, no, he wasn't killed. Don't be silly, he was in a tent at the back. -No, no, no. He was there. But once he realised the cause was lost, he fled. leaving probably 700 rebels dead on the site of the battlefield. Hundreds of others were captured and, in due course, were tried. set out to make examples of all those who had threatened his rule. at the Tower of London of his nephew, the Duke of Monmouth. Were they all tried separately or was it a sort of class-action? treated better if they did so. -And so a lot of people did. But it didn't quite work out like that. now faced the wrath of the ruthless king. Hundreds were publicly hanged or even hung, drawn and quartered. Others were sent to the colonies to live as slaves. but he was unpopular with the largely Protestant population. royal acts of vengeance in our history. Back to our friendlier battle. who are making their way to the outskirts of the town of Cullompton. If you could play any part in any film, who would you be? I'd like to play a really nasty, evil person. -No, you have not got it in you. -They are always more fun. -You haven't got it in you. -She's another thing, she is. -I'd like to play this woman who wins at an auction. situated within a wonderful old tannery barn. And the doors are open for our cheeky pair to rootle about. -I'm Richard. Nice to meet you. -Richard, Phil, how are you? There is a bit for us to go at here. -I'll go and look mine. -I'll go and look my way. And old hand Phil thinks he has found something. Have a look at this, Jo. -This is like a burr walnut or pollard walnut. Burr is when it happens naturally, pollard is when it is man-made. but if we buy this, we have got to polish it. That is what we've got to do. But isn't that just lovely, that timber? -You and I said it is walnut. Richard has got burr oak down. I don't care because it is burr wood. That's the thing. So that's one rooted out. Ha! MUSIC: Munsters Theme Oh, Lordy! Do you think that looks look like James Braxton? -Yeah. Should we buy it for him for a little present or...? Yeah, cos I've heard it said that he is a little boar. I can't think of anything worse in my living room. then I am prepared to have it. £195. Is it all right without getting it down? -He is missing lumps or...? -It's not your thing and it's not my thing. -It is not my thing. You know what, at this point in the game, we've got my thing. We've got the glasses, we've got the bag. You know, I'm satisfied with some pretties. What is the absolute death, if you pardon the pun, on that? I could do it for 100. I have no idea what they will collect at auction. It should make a profit at that. If you say so, Richard. Not the prettiest belle of the ball, though. Decision time, Jo and Phil. You fancy our boar, don't you? I am worried about his chipped tooth. And he's horrendous. Richard said around 100 for the boar. Right? If you have a result, it could make one 150, 160.
and the table for about 130 or 140 quid. That is what I'd love to do. -I'm going to let you schmoozel him. OK, so you might have overheard a bit of that, Richard. -I heard some of it, and it made me very nervous. -Well, I would like 100 for Boris. And the table... I was looking for 80 on that. 180. You wouldn't take 145? That's our... Because our budget now is low. so that is going to be hard. I'll meet you the classic halfway. -Did he just say 150? -160. It will be the best I can do. -No, he has got to make a profit. But I've got a feeling I've got to go and polish that table, haven't I? Yeah, we better get polishing. Thanks, Richard. I'll take a photograph of it too. for £70 and the stuffed boar's head for £90. I think that is enough drama for one day. Time for a bit of elbow grease before you retire, I fancy. The girls are up with the lark. The sun is shining, the roof is down, the competition is well and truly on. I am hoping today for some glittery, girlie, sparkly stuff. -No, you can't do that, I'm doing it. -I am doing glittery, girlie stuff. I just said to you, I am hoping to find glittery, girlie stuff. And what of their esteemed guides on this adventure? How are you getting on with Sunetra? Is she good? She's a lovely lady. She is very petite. -So you've got a complete contrast on your team, then. Well, you are not petite, are you? Are you implying I'm fat? Yesterday, our troops had very different buying styles. and the silver-plated Indian tray. Philip and Jo spent £210 on a really mixed bag. offerings of the occasional table and stuffed boar's head. The gang have all made their way to the city of Bristol. Oh, here we are. Here we are, here we are. Watch out, James! Oh, Lord, not again. -How are you, lovely, you all right? Good to see you, my love. -Are we ready to buy good things? We have a boat to catch. -Have a really lousy, stinking day. This is the day we win. James is behind the wheel of the Jag. Do you think I could don a white cape and a stethoscope? -Oh, yeah, you look a doctor. -You know you look like a doctor. -In fact, you could probably be like a surgeon type. -Do you think I might be...? I wouldn't go as far as consultant. I am a consultant. Let's just get it out there now. James and Sunetra have just under £300 to spend. Right, so let's get off our shopping head back on. -Hi, Jay. James. We've met before, haven't we? Have we got anything new and tasty and cheap and...? -Fabulous, that is what we wanted to hear. -Yeah, there is plenty here, you know that. With the focus of the hawk, Sunetra spots something. Please tell me that is real and not reclaimed. It looks like it may be a bit home-madey, if I'm honest. Generally, they were handmade, weren't they? That is something, though, isn't it? I mean, isn't that a risk? Yeah, you can see, it's a bit ply-y. Look at that. Get on top of the records. -And I'd imagine... Yeah, the top lifts up on that one. Look at that, a girl's dream! It is an amateur-made one, Jay is right. It has been sort of put together. How much is this, Jay, then? -She says, holding the door that is not on it. -It's fun, it is girlie. like to mess around with it anyway, don't they? The people who buy that sort of thing. So, my question is, for this price, will you give it to us? I'll do it for 15 quid, split the difference. How is that? -Come on, it says ten. He doesn't mince his words, does he? -We got ourselves a £10 deal. -You got yourself... You got one. -I don't know what this is going to do. -Jay, I don't know why I'm shaking your hand. -Has anyone ever done anything like this on the show before? -Quite wisely. No, it's lovely. -Cor, that makes it, doesn't it? Doesn't it? Do you know what? It is a really lovely blank canvas. I think there's a minimalist feel about it. so much fun decorating inside there, making it her own. -You'd love that, wouldn't you? -It's a child's view of a house, isn't it? -Yeah. Very good muscle toning, this. I am lifting a house. There we have it, a doll's house for a tenner. Ahoy there, Phil and Jo. journey of unimaginable bravery and adventure. Here to guide our landlubbers is Dr Evan Jones. -Philip. How are you? Good to see you. -Welcome to the Matty. Please come aboard. the same town and year as legendary explorer Christopher Columbus. And the comparisons don't stop there. the perception of the world at that time. If he was Italian, how come he was in Bristol doing this? and he'd gone on to Verona, actually. but they weren't interested because they had their own explorers. "Look, I can discover Asia for you. "I can... We can sail across the Atlantic. "the Caribbean islands, and that is clearly not part of Asia." -There is no silk there. There is no spices. "We can go together. "We can go on a more northerly route. "We'll find China and Asia and it'll make us all very rich." things to trade. Are they just looking for things to trade or...? or did they know that silk existed? Did somebody somewhere...? Oh, yeah. Silk had been coming to Europe for 1,000 years or more. They knew these goods existed, and they were fantastically prized. price in England, bring it back and then sell it for 1,000% profit. I mean, that was the whole thing about it. It was all about trade. The search for a route to Asia was seen by most as suicidal. the rewards outweighed the dangers. into the unknown was no small feat. When he sailed off, what do you think he wanted to achieve? Where did he want to go? He wanted to sail west across the ocean and find China and Japan. -thought the world was much smaller. -What kind of crew would he take? How many people would he get together for this boat? than it would be normally. -and would probably have about ten or 12 men aboard. But he wanted a bigger crew because you're sailing across the Atlantic. whereabouts exactly did he land? Newfoundland. Actually, the new found land. -Do you know, that has never dawned... New found land. So it's like the eastern tip of what's now Canada. Cabot failed to discover the lucrative route to Asia. opening up a new world of trading routes and perceptions of the planet. Mystery surrounds his next and final attempt to secure a route to Asia. Despite leaving with a bigger and better fleet, he never returned. securing a century of unprecedented wealth for the Portuguese nation. amongst the people of Canada and, in particular, his new found land. He has got some guts, hasn't he? -Something... Something dainty or small. If it has got sequins, all the better. They have got over £300 weighing down their pockets. -This looks promising, doesn't it? I have got a good feeling about this place, James. Lots of jewellery. Look at that. -Yeah. Come on, let's keep going. I love the enthusiasm, Sunetra. -Hi, Sunetra, nice to meet you. You are going to have to be our best friend for the next couple of hours. -I am keen on finding. -we will have something for you. That doesn't really sound up James' street. -That George and the Dragon. I love enamel. -It is actually a crown. -Yes, I'd like to have a look at that. -A crown that has been enamelled into a brooch. So when do you think the enamelling was done? -I would say probably about 100 years ago. And is this a silver crown or silver-plated? That sounds rather cheap to me. Well within your budget, that's for a fact. But what about something Sunetra loves? This really does fit in the modern world. I mean, it's stylish, it's plain. Could be a winner, Sunetra. Listen, we need to warm you up. £60. Cos we want to get something happening here. You haven't dealt with Sunetra before. And if you... Say for argument's sake, I started at 45.
that means that we're not even bargaining with you on that one. I reckon, sort of, meeting in the middle, about £80. I think that'd be a good deal. -35. And that's 35. 70. I think 70. 75 and we have a deal. -We can call it a day. -..put our paws on that. But if we have to go to 75, we'll just keep looking. Cos you've got so much beautiful stuff for us to carry on looking at. -Thank you, really kind. Well done. You definitely get a kiss for that. -We're done. Come on, Julian. Come on. Can't go on forever. secured the George III silver brooch for £35. And the Norwegian brooch also for £35. I think we've done very well. Meanwhile, Phil and Jo are on an adventure of their own. of Westerleigh, in South Gloucestershire, to be precise. -No, but it is beautiful. We'll get somewhere eventually. There must be antiques. Where there's hedges, there are always antiques. Well, that is certainly Phil's philosophy. Oh, hold on. This looks more like a farm than an antique shop to me. Hello. Is this your farm? -Are you just going about your everyday work? Anything that is sitting about that we can take off your hands? -Have a delve in the shed, if you want. Would you mind us having a look? James is a farmer, but you never know what might be lurking about. So you don't want any of these? Probably not, no. They have been sat there for as long as I can remember. -..I would guess 20, 40 quid, something like that. and buy them cheaper than that. -Think of it as, like, removal, scrap removal. Good point, Jo. That's the milk churns as a possible. Where are they off to now? Oh, look. I love the door already. Uh, I'm not sure it is Phil-sized. I like the look of that as well. Phil, there is actual furniture in here. It looks like Jo is being treated to the full Serrell experience today. I think this is a bit cheeky, clearly. "In your face," that would be great. right at the back of the barn, as you would. Could we have a look at that galvanised tank? -You are never going to get that out. -Yeah, I'll have a try. It's in there, look. Just getting it out is going to be difficult. Yeah, you would have to pick the thing right at the back, Phil. -How strong are you, my friend? -We'll see in a minute. Right, can you bring it up? That is bloody heavy, that is. It is awful heavy, Jo. I got a chair, though. You got the rest of my elbow with it. I think you should move. and we are taking a galvanised tank. James, if it comes to a fight, will you be on my side? You are doing great, guys. Don't worry, James, in your own time. Is that a smile of pain, Phil? -No, I don't like that. And the old milk churn, I would see that at like ten or 20 quid. Maybe we could have the two for 25, and that would be amazing. People would talk about James the farmer forever. Might be laying it on a bit thick there, Jo. -You were just pottering about, at work. Just a slight hint here, right. -I have been with her now for two days. OK? -He's going to swap you. -You know, if she doesn't get her own way, she is difficult. -Oh, 25 for the churn, please. -20 quid for that, five for the churn. to have it in your barn forever and ignore it. Jo, you certainly know what you are doing, girl. £20 the big clunking trough and a fiver for the milk churn. Time to have a gander at one another's buys. One, two, three, lift and throw. -Look, this looks a bit classy. -I like the brooch, yeah. -That's lovely. That is really, really lovely. -The one at the front? or are you just saying that? Is this fighting talk? It's an old silver crown. It is an old silver crown that's been enamelled. -I like the green brooch here. -That's an age thing, isn't it? I mean, I wouldn't bid for it at auction. -Well, you won't have to. The sign is quite nice, I like that. cos there is just a hint of rust. Now for the unveiling of Phil and Jo's goodies. -I like the shape of that. -It is rusty. How much? -You have moved into a new sector of erosion here. but now you're doing moth. -How much was the boar? -That was our top buy, 90 quid. -And you questioned our sign for 99? -I like your Dame Edna. -Do you like my Ednas? Look, six pairs of interchangeable frames. -Go on, James, you give us your thoughts. -I don't like the moth-eaten boar's head. Trough, how much did you pay for the trough? -20 quid. Which is cheap. I'll tell you what, it's a cheap coffin, isn't it? OK, I feel a little bit better now. I feel a little bit better. Good. But what do you really think, gang? I really like that green brooch. -See, I like the other brooch. so there is something about that one that is a winner. -I like the glasses and the bag. moth, woodworm... Normal sort of stuff. -I think we have the upper hand. Would you swap? but I know that you are very good about this. -You are confident about this. -I don't know about that. You know, we are going to win. -We are going to win. I feel it. -We are going to win. -We are going to win! first foray into an antiques auction. -So, I have a little surprise. I came across a really lovely straw hat. -In fact, it is just down here. -It can be our joint prize. Today's auction is being held at Henry Aldrich & Son. -Look at what I brought! This is all very lovely, but we have got an auction to attend, guys. -This is called the winner's hat. -It has a feather in it. You start with it, let's see where it ends up. Very suave. Let the battle commence. Henry's Aldridge is today's auctioneer. Now, what does he make of the rather unusual mix? £10, 15. Ten, ten, ten, ten. Going, ten. The boar's head, I think Lee said it is mended. The Norwegian brooch, I think, is the nicest thing. They are always very collectible. Sounds promising. Jo and Phil were this trip's big spenders. and added a sparkling feminine touch to the usual offerings from Phil. They spent £235 on five items. although Sunetra was very loud when it came to settling a price. They spent £184 also on five items. Get comfy, the auction is about to begin. and Philip with their big milk churn. Ten I've got. Ten I've got. 15. 20. Look, it has got 25. £25 seated in the middle of the room. -Oh, gosh, who are these people? Good start for a random farm item. And here's another one, the galvanised trough. 20 I've got. 30. 40. 50. -James the farmer, I love you! Anyone going to give me five? I am going to auction houses every weekend. That was the best performance you have ever done in your life. a thing or two about buying and selling. -We are in trouble. We are in big trouble. What about the doll's house? Someone's grandchildren are going to love this. -He worked hard at it. We'll just keep the hat for a while, shall we? At least it sold for a bit of a profit. but your big risky boar head is next. At 55. 60 anywhere else? At £70. At £70. Is there five? -Yeah, I don't think Jo is too happy, Phil. Poor old boar didn't bring home the bacon. I buried my husband alive, actually, on that, yeah. -If you want to go there. Um, I don't think he does. Now, it is Sunetra's big risk item, the enamelled sign. I'll start at the bottom. 15 quid. Trust me. 20. Five. 30. Five. 45. 50. Five. 60. Five. We've got to try to get 99. James, I take my hat off to you, mate. It's wiped its face, as we say in the business. But they are still behind Jo and Phil. We better put this somewhere in the middle again. Let's keep that just over this side of the woods. and Sunetra. The silver-plated Indian tray is next. 20 I got. 22. £20. 22. -I wanted more. I want more! -We should have been on the same team. and it looks really pretty. Leave it there, you've done enough. Is there two? Any more, quickly? -Another little profit for the Sarker team. Nice and steady profits from James and Sunetra. This is a close-run race. Can Phil and Jo's little occasional table offer a weighty profit? because it has got a bit of rust on it. You are turning into a really nasty piece of work. Listen, could you two just take your argument somewhere else? for the first time. This is really serious business. Yes, my sentiments exactly, Sunetra. 40 I've got. 40 I've got. Five. At £60. Is there five at 60? Someone's got a good buy there. It is James and Sunetra's George III crown next. Right, £20 I've got. 20 I've got. 20 I've got. -Oh. That's good, isn't it? -I thought it would do better than that. But it is still a decent profit. It is Jo's favourite next. The combo lot of vintage spectacles and little handbag. The lady wants them. Anyone going to buy them for her? But someone has a real little treasure there. It is their last item. And it all rests on James and Sunetra's Norwegian brooch. This is me. I have to take full responsibility for this. Five. 50 in the middle of the room. and it is always nice to end on a high. Time to tally up the scores. Who will be the triumphant winner? Jo and Phil started out with £400. they made a small loss of £17.70. Their final total is £382.30. Sunetra and James began with the same sum. And after auction costs, they made a profit of £25.92. Yeah! They are the ecstatic winners today. That was good fun, wasn't it? Anyway, I have the results. -Who has got the hat? And a small loss for you. A brilliant competition, you lot. -I loved it. It was really good fun. -I did too. I loved it. Just like we planned it. This is our Thelma and Louise exit, isn't it? Auction houses all the way. Joyner and Sarker, their own auction house. This is such a bad day. Cheerio, girls. You have been smashing. See you on the dance floor, Sunetra. Two sparkling doyennes of British drama join the road trip as great friends Sunetra Sarker and Jo Joyner go head to head in the search for antique treasure. With antique experts Phil Serrell and James Braxton at their beck and call they visit shops, and the occasional farm, around Somerset and Devon before taking their wares to the decisive auction in Devizes, Wiltshire.